If you've got your own videos on your computer that you want to share on your blog, Blogger now allows you to upload video directly! If you'd like to share a video from YouTube, you can do that, too. To embed a video from YouTube, just copy the code from the "Embed" box on the video's YouTube page. 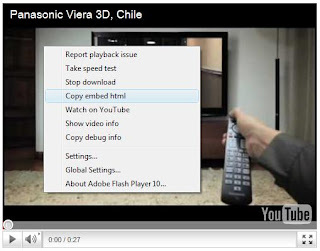 You can find the "Embed" box in the "About This Video" box when you're watching the video. You can also get the code from the "Embed HTML" box on the "Edit Video" page if the video belongs to your YouTube account. Or simply right click on the video and copy the "embedded html code".